April 10, 2015. After witnessing Good Friday festivities in Lisbon, we decided that a well-rounded approach demanded we visit some pagan spots within walled city of Évora. 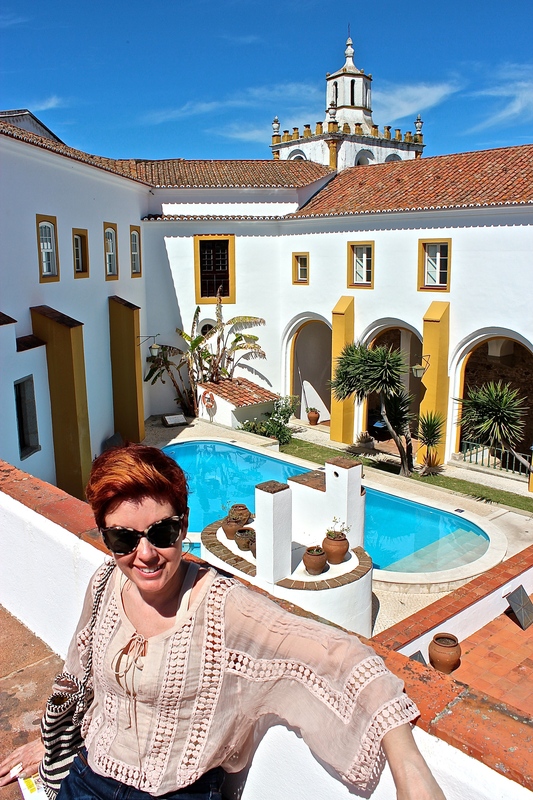 For those of you who haven’t heard of the town, Évora is a UNESCO World Heritage site that is chocablock with Neolithic, Roman, Moorish, and Medieval ruins — enough to keep a body busy for at least a week. But as usual, we decided to cram it all into two days. The pool at the Pousada dos Lóios. Our first order of business involved checking into the only hotel in the central part of town with a last-minute opening — the Pousada dos Lóios. Formerly a 15th-century monastery, it now rents out the monks’ cells to those who don’t mind small but elegantly appointed spaces. Of course, the place has been upgraded quite a bit since Medieval times, so guests can hang out in the pool, dine in the orange-grove cloister, or get a drink in the bar. The decor is as you’d expect for an ascetic order: simple clay-tiled floors and white-plastered walls. Mission-style furniture, lots of oak, leather, and wrought iron — as well as several paintings of dogs tearing bears to bits — remind you that this was originally the domain of men, just in case you forgot. But the overall atmosphere is peaceful and serene, a great place to take shelter from the heat of southern Portugal. Looking down into the orange-tree cloister. The yellow paint is supposed to scare away evil spirits, and in fact, it does help deter flies. It’s used for trim around windows all over Évora. Some of the more detailed paint schemes. Matthew the devout, exiting the monk’s cell that is our room. 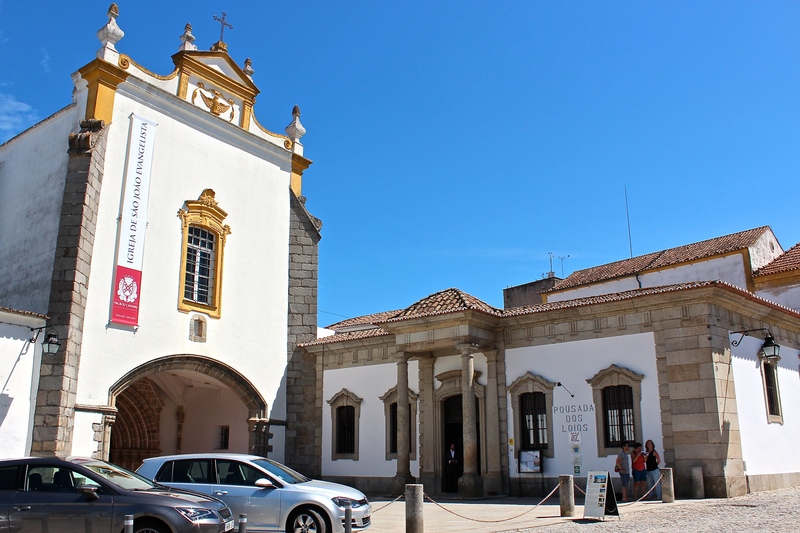 The Church of Lóios is right next door to our Pousada. The Manueline front porch of the hotel dates back to the original convent of 1485 and is one of the few sections left intact after the great earthquake of 1755. The living Dukes had their own gilded balcony from which to watch the Mass that took place in front of the church’s impressive gilded altar. And just in case you didn’t know the family was rich, the nave and aisles of the church are coated in costly blue-and-white azulejos tiles. At the time they were installed, they were pricier than the gold fancy bits scattered around the church. “Who are these fabulously wealthy Cadavals?” you might ask. Our curiosity had also been peaked, so we headed next door to their palace. The gilded and tiled interior of the Church of Lóios, the Cadaval family chapel. A tombstone of one of the Cadaval duchesses. A floor hatch leads to an ossuary that is supposedly stacked with the bones of monks. A cistern dates back to the original Moorish castle, the foundation of which still lies beneath the Cadaval church and palace. The Baroque altar. Rather plain, isn’t it? The Cadaval family box seats kept them high above the riffraff. The azulejos are 18th-century designs that mimic the blue-and-white delft tiles of the Netherlands. Each tiled panel tells a story from the Bible or church history. Turns out, the Cadavals still live in the palace, which is also a museum that is open regularly for tours. It was kinda fun to see family photos of weddings, christenings, and occasional meetings with heads of state, all just sitting out on side tables and mantlepieces. Though quite lovely, “palace” might be too grand a word for the home, as its size and casual décor gives it the feeling of a well-loved and lived-in country manor (with a few pieces of armor tossed in for flair). My favorite room was the spectacular 16th-century kitchen — I now have serious copper-pot envy! A fabulous 16th-century fireplace in the Cadaval palace. Palace photos show various Cadaval family members, including the current Duchess’s royal French husband, Prince Charles-Philippe d’Orléans (of the House of Bourbon-Orléans). Matthew tempts me with copper. And of course, fabulous dishes line the walls of the 16th-century kitchen. A few vintage Louis Vuitton pieces for Cadaval family weekend travels. Our “Lifestyles of the Rich and Famous” moment over, we trotted across the street to the evocative Roman Temple. Still used today for concerts, the temple is atmospherically lit at night. And on hot days, you can admire it closeup from the outdoor cafe situated in the shade of its massive bulk. Fourteen Corinthian columns still stand as testament to Roman construction methods, along with a nearby, beautifully preserved Roman arch, a portion of a wall, and part of a bathhouse. Rich in wheat and silver, Évora was an important Roman city from the 1st to 4th century A.D., and this temple once sat in the city’s forum. A portion of the old Roman wall. Originally called the Temple of Diana, it was more likely dedicated to the worship of the Emperor Augustus. Called the Porta de Dona Isabel, this arch was once the main gate in the Roman wall that encircled the city. In the foreground, some of the large, irregularly shaped, original paving stones can still be seen. A nighttime view of the temple. It looks a bit neon-ish in my photo, but the lighting is actually quite pretty. Mary the fertility goddess pats her baby bump and raises her hand to swear it’s an immaculate conception. 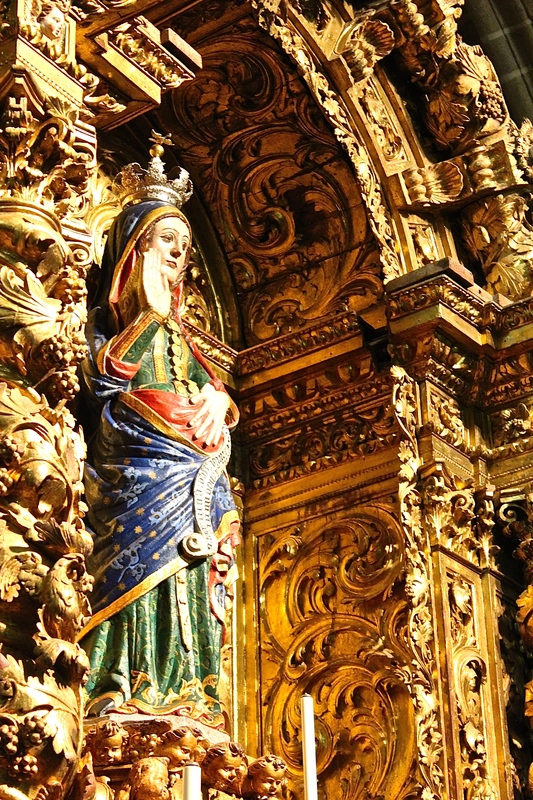 Continuing our tour around the city, we jumped forward in time to the Medieval Era with a tour of the Cathedral of Évora, which has an elaborately gilded chapel housing a statue of a pregnant Mary. As the story goes, the first priests hoped to convert the Celtic pagans to Christianity by capitalizing on the fertility goddess aspect, hence Mary’s “baby bump.” Family members of pregnant women supposedly still come here today to pray during difficult deliveries. Climbing up to the roof of the Cathedral — an amazing experience I’d highly recommend because, hey, how often do you get to climb around on the roof of a 12th-century church? — we encountered a fabulous view of the Alentejo plain stretching towards the Algarve. After a peek down into the orange-tree-studded cloister, we hunted around and finally managed to spot the carving of Giraldo the Fearless, a Christian knight and local hero who managed to boot out the Moors via a surprise attack in 1165. Built in the 12th century, the Cathedral of Santa Maria de Évora is a mix of heavy Romanesque and lighter Gothic styles. The church was built upon a Moorish mosque, which was built upon an even earlier Visigoth chapel. What goes around comes around. Carvings of the four evangelists decorate the corners of the cloister. Matthew climbs to the top of the spiral stairs that lead to the cathedral’s roof. Crenellations give the church its “Fortress of God” atmosphere intended to inspire awe (and fear). Flaming Baroque vases nicely frame the view of the Alentejo plains, known for wheat, cattle, wine, and cork oak trees. The cloister provides a shady retreat on a hot day. Check out the two decapitated-but-still-smiling heads of Moors above Giraldo the Fearless. Our church hopping not yet complete, our next stop was the Church of St. Francis and the Chapel of the Bones. While most of the church was under wraps due to restoration, the Chapel of the Bones was luckily still open for business. And boy, could it give Paris’s catacombs a run for their money. Femurs, skulls, ribs, and other body parts of around 5,000 monks have been eerily and “artistically”arranged into arches, columns, and other decorative elements. And like the Paris tombs, the chapel flounts pithy phrases, such as my favorite: “The day that I die is better than the day that I was born” — which appears next to the shriveled corpses of a man and child hanging from the rafters. Three Franciscan monks — who were concerned about society’s values in wealthy 16th-century Évora — built the place with bones from churchyards to help folks meditate on the impermanence of material goods. Note the skulls used as trim along the ceiling’s painted arches. The bones supposedly came from overcrowded churchyards that needed more room for the newly departed. For a little more cheer and sunlight, we returned to Praça do Giraldo, the city’s central square, where we enjoyed an ice cream and sat next to the cooling spray of water from a 16th-century marble fountain. A bit more walking brought us to the fountain’s source, an aqueduct reservoir by the name of Mãe d’Àgua (Mother of Water), built in the same century. We continued to trace the aqueduct as it gradually rose in elevation atop graceful arches until it brought us near the peaceful lane that housed our dinner spot. The aqueduct continues through town, where folks have incorporated it into buildings. The fountain at the Largo da Porta de Moura (Gateway to the Moors) dates to the 16th century and was used for washing cattle and clothing, as the worn spots on the marble reveal. The 16th-century marble fountain in front of the Church of Santo Antao. The granite-columned end of the Mãe d’Àgua aqueduct. Following the recommendation of our Rick Steves guidebook (Rick rarely steers us wrong), we decided to opt for the low-key Taberna Tipica Quarta-Feira, known for its expertly served game meats. And let me just say simply that the place did not disappoint. The owner, Zé Dias, was a delight, who served up some amazing appetizers, including a baked cheese, locally sourced and smoked ham, and a dish of mushrooms that made me yearn for the recipe. Our main course was an enormous slab of black boar that, I have to say, was the best meat I’ve had in years. Melt-in-your-mouth tender and juicy, I only wish I could have eaten the whole thing. I had to laugh at one point, when, after turning away potential diners from an empty table, the owner shrugged his shoulders and said: “I’m tired. I stop serving when I’m tired. But no worry, they’ll be back tomorrow.” We knew how he felt, as we dragged our burgeoning bellies back to the hotel, stopping along the dark alleyways just long enough to pluck a ripe lemon from an overhanging tree and enjoy the peaceful cooing of doves settling down for the night. Yummy appetizers and a fine house wine. An overburdened lemon tree dropped its bounty into the lane at our feet. Black boar, with a side of roasted potatoes and stewed spinach. Dessert included a fantastic honey cake with fresh fruit and a glass of ginginha (a sort of cherry-flavored liqueur made only in Portugal).